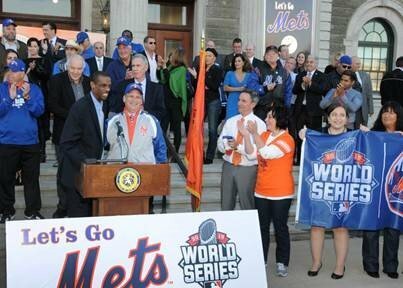 Nassau County Executive Edward P. Mangano was joined by 1986 NY Mets World Series Champion Dwight “Doc” Gooden while Met fans, young and old, cheered at a Pre-World Series Rally. Mineola, NY - October 28, 2015 - Nassau County Executive Edward P. Mangano was joined by 1986 NY Mets World Series Champion Dwight “Doc” Gooden while Met fans, young and old, cheered at a Pre-World Series Rally held on the steps of the Theodore Roosevelt Executive & Legislative Building in Mineola. Joining County Executive Mangano and Gooden were two former 1969 World Series Champion NY Mets players Art Shamsky and Ed Kranepool, and former NY Mets player and current L.I. Ducks Manager Kevin Baez. Local radio stations pumped the crowd up with music and some give-a-ways, but the unexpected treat came when a representative chose some unsuspecting veterans from the crowd and offered them an opportunity of a lifetime. Two local veterans were asked to participate in this Friday’s home game along with over 100 other veterans who will take to the field holding a massive United States Flag. After the opening ceremony, these veterans will then get to root, root, root for the home team! Surely the people in Citifield heard everyone shouting all the way from Mineola as the countdown began and County Executive Mangano flipped the switch illuminating the dome of the Theodore Roosevelt Executive and Legislative Building blue and orange in honor of our beloved NY Mets. Subject: LongIsland.com - Your Name sent you Article details of "Mangano & NY Mets Legends Host Fan Rally For The Amazin' Mets"